WATERLOO – Wilfrid Laurier University’s Lyle S. Hallman Faculty of Social Work will host its eighth-annual research forum on Feb. 23 from 8:30 a.m. to 1:30 p.m. Topics to be explored include post-schooling employment, resilience in conflict zones and working successfully with communities. The forum is free and open to the public. In addition to attending the presentations, participants will have the opportunity to speak to Laurier researchers about their ongoing work. “We will explore the strengths, limits and challenges of working with community," said Ginette Lafrenière, associate professor of Social Work and director of the Manulife Centre for Community Health Research. "I encourage anyone who wants to authentically work with community to attend this event and speak with the students directly involved in this rewarding work." The event will open with a keynote address from Jesse Near, recipient of Laurier’s 2014 Gold Medal of Academic Excellence. Near has worked with the Ministry of Children and Youth Services in a secure custody setting with male youth since 2006. While at Laurier, her research explored what makes youth who are in trouble with the law avoid reoffending. Eliana Suarez, assistant professor of Social Work at Laurier, will present her work documenting the aftermath of armed conflict in Peru. 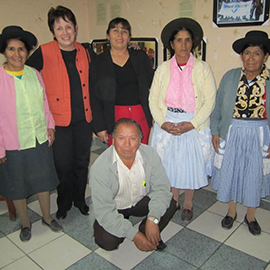 Her research with Quechua women calls for enhanced recognition of women not only as victims of violence but also as courageous social actors in recovery efforts. "Social workers must not only help survivors of war to cope individually, but to recognize that communities must come together to rebuild their social lives,” said Suarez. “Social workers can help with this process of collective resilience." The Lyle S. Hallman Faculty of Social Work was the first in Canada to combine a holistic Indigenous worldview with contemporary social work practice. The school continues to integrate its work in the community. The Social Innovation Research Group (SIRG) and the Manulife Centre for Community Health Research (MCCHR) will also be sharing their frameworks for conducting authentic and mutually beneficial university-community research. The forum is free and open to the public and will be held at Laurier’s Faculty of Social Work, located at Duke and College streets in Kitchener. Register at http://bit.ly/1DwfiSN. For more information about social work research, visit www.wlu.ca/socialwork.